It helped launch the sea borne invasions of North Africa, Sicily and France. But over the years the memories have rusted, to be replaced by holiday snapshots of a world at peace. The tide of history, however, was baulked yesterday by a most unlikely Canute - a 71-year-old retired teacher who has led a campaign to erect a memorial to the Second World War base at Rosneath, near Helensburgh, which played a huge and now almost forgotten part in the Allied victory. The base was closed in 1948 and is now the site of a holiday camp and residential area. Almost no sign of what took place during the war has been left standing. However, Mr. Dennis Royal, who saw the base in action as a boy, wanted to make sure future generations could learn about what happened there so he began a campaign to have a memorial erected on the site. Mr. Royal was partly motivated by watching the 50th anniversary of the D-Day landings on TV. He said: "I watched but there was hardly anything about the Clyde, yet it was very important. The TV footage was pretty biased to the south coast of England and the part it played." 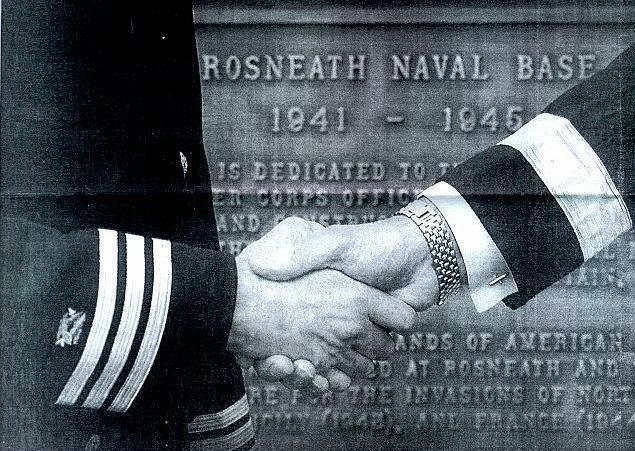 The Rosneath base was built by American civilian contractors and US Navy civil engineers in 1941 and 1942. It began by serving as a turn-around point for ships protecting the movement of convoys in the North Atlantic, servicing and repairing them. Mr. Royal said: "It had extensive machine tools, a tank farm that stored 200,000 gallons of fuel oil, a 600-bed hospital, ammunition dump, and facilities for 5000 men. "With the decision to invade Vichy French North Africa, the base became a staging and training base for US amphibious forces. After the success of the invasion, the base was handed over to the Royal Navy with the exception of the area used by Subron 50, a US Navy submarine squadron. "In August, 1943, the base was again taken over by the US Navy for use as a training, supply and maintenance base for ships and units training for D-Day. "Ships and men of the USN 11th Amphibious Force Gunfire Support Group trained at Rosneath and were involved in the bombardment of enemy positions overlooking the famous Utah Beach in Normandy as the initial waves of American assault craft hit the beach on D-Day, June 6, 1944." After the Normandy invasion, the base housed thousands of survivors of the D-Day operations whose vessels had been sunk. The memories moved centre-stage yesterday when a memorial was dedicated by Royal Navy chaplain Martin Poll. With air shipping the charge will be around $16.93 U.S.), which includes stories of some of the men and women who served there, admitted to feeling like a nervous wreck after all his work. He said: "I will never do this again. It's hard going but it has been worthwhile." The project was supported by the National Society Daughters of the American Revolution, a US-based patriotic group, and the Anvil Trust, a local historical society. Numerous other people have made contributions including sailors who served at the base. The land for the memorial was donated by the Rosneath Castle Holiday Park. 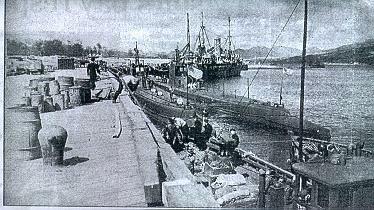 As It Was: The busy naval base at the height of its importance during the Second World War.